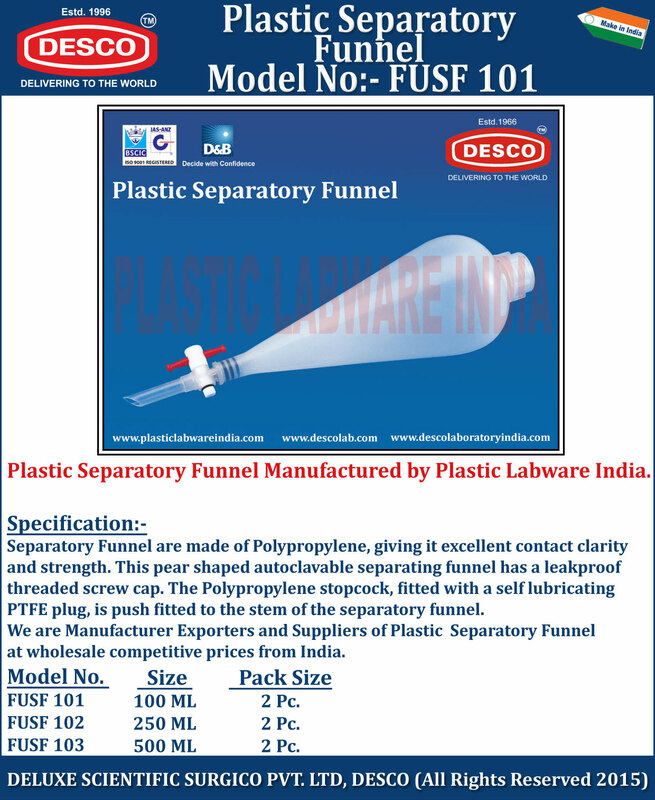 Separatory Funnel are made of Polypropylene, giving it excellent contact clarity and strength. This pear shaped autoclavable separating funnel has a leakproof threaded screw cap. The Polypropylene stopcock, fitted with a self lubricating PTFE plug, is push fitted to the stem of the separatory funnel. We are Manufacturer Exporters and Suppliers of Plastic Separatory Funnel at wholesale competitive prices from India. FUSF 101 100 ML 2 Pc. FUSF 102 250 ML 2 Pc. FUSF 103 500 ML 2 Pc.